I purchased this battery for my wife's Ford Fiesta to replace the original Ford Silver Calcium battery. Since this car has the full electric pack I opted for the Varta Silver Dynamic 063 battery which exceeds the original specification by some margin. The battery fitted perfectly and has performed faultlessly to date. I have no reason to doubt that this battery will continue to perform well through this winter and hopefully many more to come. Tanya staff helped select a battery suitable for my 1971 MG Roadster, it would normally be two six volt batteries bu Tanya found a suitably sized twelve volt which gives me better Ahrs. Great service. The battery is just what i needed. And works perfect. Needed a small size battery to fit my kit car which had suffered from hot/second start problems. This Varta battery was the highest capacity I could find in the required type, and Tayna was able to supply it next day for a very good price. The battery has now been in the car for a week and so far has solved all my starting problems. A good buy at a competitive price. Excellent battery offering higher performance than others similarly priced, replacing a previous one which lasted 8 years. Battery arrived the next day , very well packed. Brilliant purchase! Great product and delivered well packaged very quickly! Would definitely recommend and use again. Tayna delivery & price is EXCELLENT! I used them before and couldn't fault the speed of delivery & also the price, hence I didn't even shop around this time - went straight to Tayna! and will do again. The battery is what you expect from a battery. I purchased a high spec battery than necessary for the car purely because we don't use it that much, and long standing doing nothing just drains a normal battery very quickly, (i.e. a Lion battery sold by a nationwide motor factor company - rubbish constantly dying). Had Varta batteries many times before and they have all generally outlived the guarantees (I believe this one is 5 years!) Factor the guarantee lifespan into the cost and you end up paying a lot more if you chose a cheaper battery as you will be buying more of them! 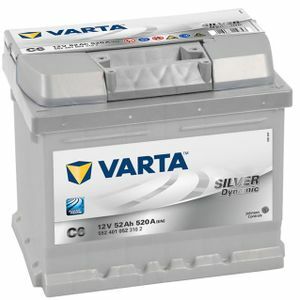 I have used Varta batteries for many years and find them to be excellent. This one is no exception and I was most impressed with Tayna's care including the exceptionally good packaging! I appreciate that the Silver Dynamic is an over kill for this car but it does a lot of start stop motoring and fitted with winter tyres is out in all weather. Excellent product and significantly better than the 4 month old battery I got from a well known auto retailer who provides fitting. The dispatch and delivery were very prompt, and excellent communication too. Can't tell much about the battery, it's a battery and it does the job. Tayna staff is friendly and answered my question really quick over online chat. I will repeat Tayna whenever I need a new battery.